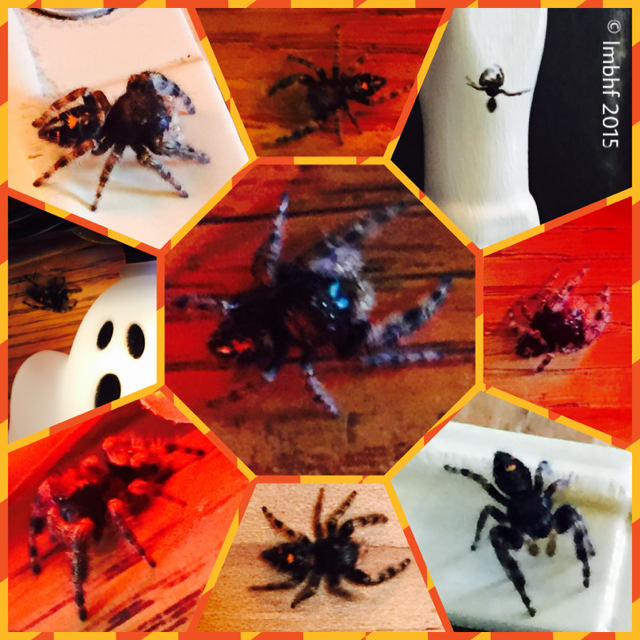 In keeping with the spirit of Halloween, I decided to write a post about Spiders! I wouldn’t go as far as to say I “like” spiders, although I wouldn’t say I “don’t” like spiders either (unless of course they are crawling on me or going to bite me, I certainly don’t like that!). I have a cousin (whom I now know is completely crazy – sorry RCT!) that had a picture taken with a tarantula on his face. Although he did say he wouldn’t do it again, so maybe he’s not completely crazy, but most positively somewhat crazy! I would never, ever do that! However, spiders definitely fascinate me, and they truly are amazing creatures!! So, I decided awhile back to photograph all of the spiders that I saw for the next few weeks and write a post about them in October. Now, spiders are hard to photograph and I am not a professional photographer and alas my camera isn’t very good, so the images are not all crystal clear. Still, they are fun to look at and the fuzziness of some of the pictures make them look even more creepy! 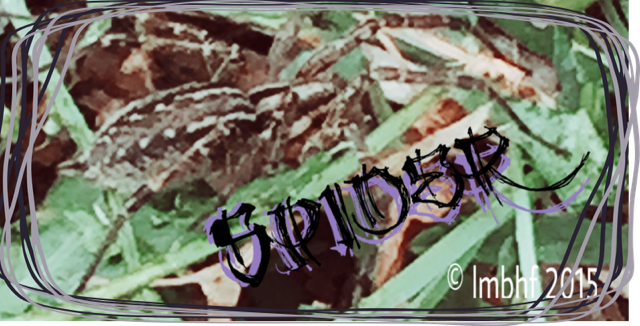 I know this post will incite some of my readers to scold and chide me for doing such an evil thing as to write about spiders. In fact, I’m sincerely hoping that my dear Mother in Heaven has gained a new perspective and an appreciation for those quaint little fellows we call arachnids. If not, and if she happens to look down and see that I’ve written a post about spiders and spent my time photographing the vile creatures, she will most certainly disown me for all eternity! Nevertheless, I shall boldly and bravely proceed to finish writing my post and share my photos of a few dashing Creepy Crawly Spiders with you. ‘Cause really, I know my Mother’s love is unconditional! 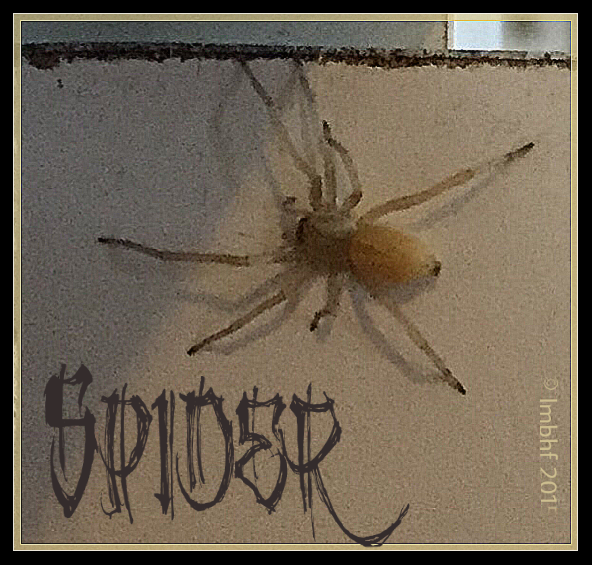 This is the spider that I photographed while he crawled around the decorations (orange lights, white ghost lights and fall leaves) on my banister. See his beady little eyes in the center pic?! 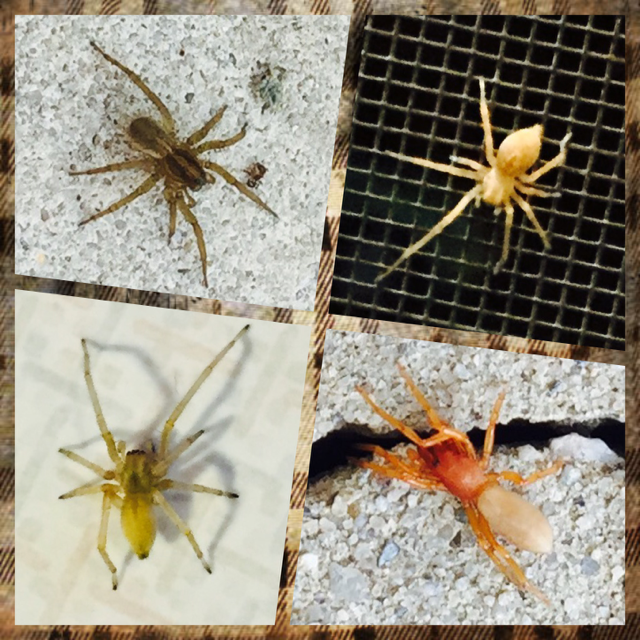 These are miscellaneous spiders that I came across. The one on the bottom right was actually orange! Check out this guy’s legs. He had them all curled up funny and I wondered if he was not feeling well, but then I spooked him so he straightened them right out. 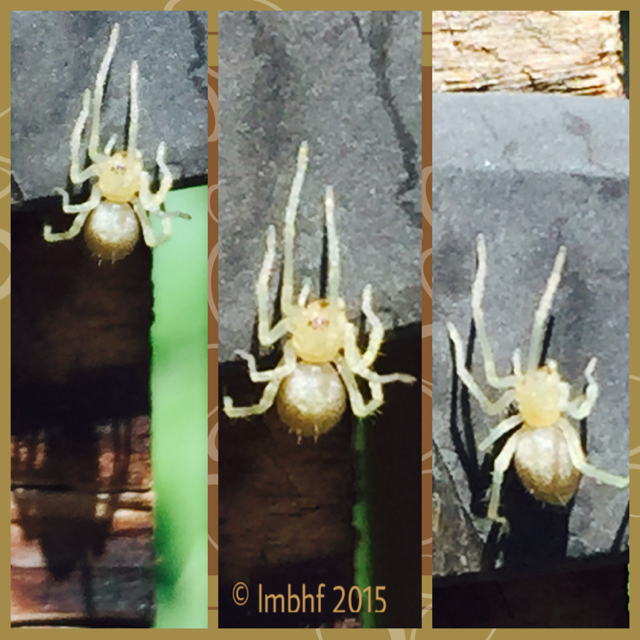 This is the grand daddy of all the spiders I photographed. He is hard to see, camouflaged in the grass and mulch, but with his leg span, he was at least as big as a silver dollar. You can’t tell from the picture but this bright eyed little guy is just a baby spider. He was about half the size of a pencil eraser. This is one of my two favorite picture collages. 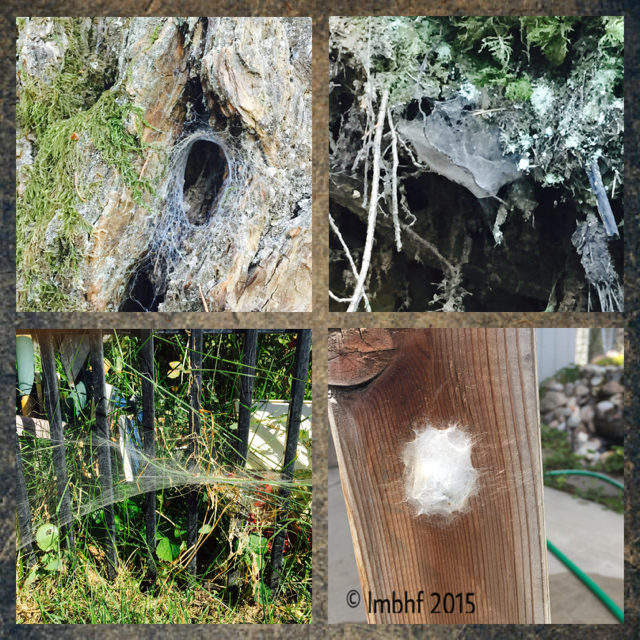 These are spider homes I came across. The two on the top row were taken during a hike to the top of Multnomah Falls in Oregon and the two on the bottom row were taken in my backyard. This is my other favorite picture. Check out this chubby little guy’s eerie shadow! 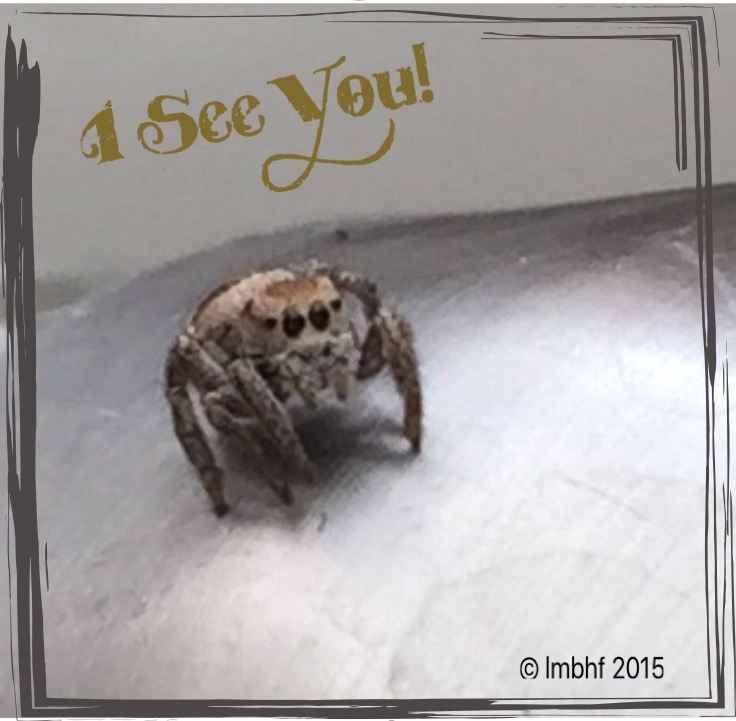 Keep your eye out for eight legged friends! They are all around you! So creepy. I’m not sure why I clicked on a spider post when I cannot stand them, but I did haha I remember one summer when I was probably about 12 or so, I was outside with my sisters (ages 9 and 5 at the time) and my youngest sister pointed out this giant spider that was on our other sister’s back. I legit hit her with a clipboard to get it off of her and we never played in that part of the yard again haha it was HUGE. I dont remember what it was called, but it’s the only time I’ve ever seen one. Wow! That must have been a scary experience!! I don’t mind spiders as long as they aren’t on me or on my loved ones. Then I can’t stand them either!! Right Beth?! I’m glad someone agrees with me! You’re welcome Vickie! Thanks for hosting! I’m similarly fascinated with bees. We have some plants in our yard that are specifically there to attract bees and I just love to watch them. They will even come and land on me once in a while, but as long as I don’t do anything to harm them, they won’t sting. Usually, they are far too busy to even notice me. I particularly like the bumblebees. They are so big and fat that it’s been scientifically proven they should not be able to fly, yet they seem to get around just fine. Adrian, I think bees are pretty cool too but I think my family is more afraid of them than they are of spiders. I agree those big fat bumblebees are awesome!